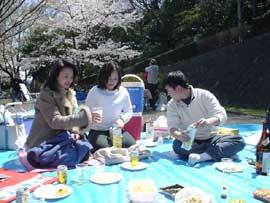 People gather to sit under the cherry blossoms, often with elaborate picnics. Japan’s hanami (‘flower viewing’) season stretches from the end of March until April, when the sakura are blooming. The cherry blossom is Japan’s national flower and the most beloved flower of the Japanese people. During its brief blooming period, people gather at parks and promenades lined with cherry trees to enjoy the flowers. Under sakura trees in full bloom, people eat, drink, sing and chat, partying until late at night. As the cherry blossom season draws near, the Japan Meteorological Agency starts a “cherry blossom front” report to inform people when cherry blossoms will bloom in a particular region of Japan. Many people check the cherry blossom front on the news and make plans for their hanami parties. Since this is one of the most beautiful times in Japan, sketching competitions for children are held across the county, and children with drawing boards are a common sight.